This entry was posted in Skip Allen & Painter 11 and tagged Brush Demo, Brush making, Brush naming, Skip Allen & Painter 11, Sumi-e Painting. Bookmark the permalink. Thanks for asking…I’ll post some of my practice ones…I guess I should have posted a few at the end of the blog. So far, so good. You’re doing great at this blogging exercise. It is a magnificent art form though, isn’t it? My experience with sumi-e like work was on clay. I used the same brushes, same techniques, but used colored slips as inks. I know, not exactly like ink. Can’t say I was a master, but I did work many years perfecting painting on clay. I have always loved the look of sumi-e. Brutal is right! But I didn’t know you felt that way about creating brushes. I thought it was second nature to you. I love what you’ve begun with this new set, Skip. Open Studio will be enlightening, for sure. It’s all new to me — I have borrowed 4 library books and I bought one from Borders. And somehow must share my Open Studio participation time with time spent in your class. Fun. Challenging. Have you told everyone you are a teacher? An outstanding instructor at the Digital Art Academy??? http://www.digitalartacademy.com May I brag for you? Nothing is second nature, Barb. It takes work for me to do anything; maybe it looks easy or like it is second nature because I tend to laugh my way through the endeavor. The new set keeps changing. Be sure to keep the set I sent you separate from the final set. This morning I have been very brutal in the culling process, and I keep tweaking. I don’t think the latest edition resembles the original at all. I think I have mention being a teacher. I’m not sure. Right now, I am definitely a student and I have lots to learn about this blogging business. I think you write loverly. And the brushes are awesome. Post me a Pic you make with them. I loved the e-Sumi site you showed me last week. Cool Stuff. Not enough time in my life to do everything I would like to. Like I mentioned, I have a Wacom pad and have been using a pen (brushes) in PS for years. I would love to do Painter… but spread thin as it is. See ya around new friend. I plan to put some on the next blog post. Appreciate the visit. 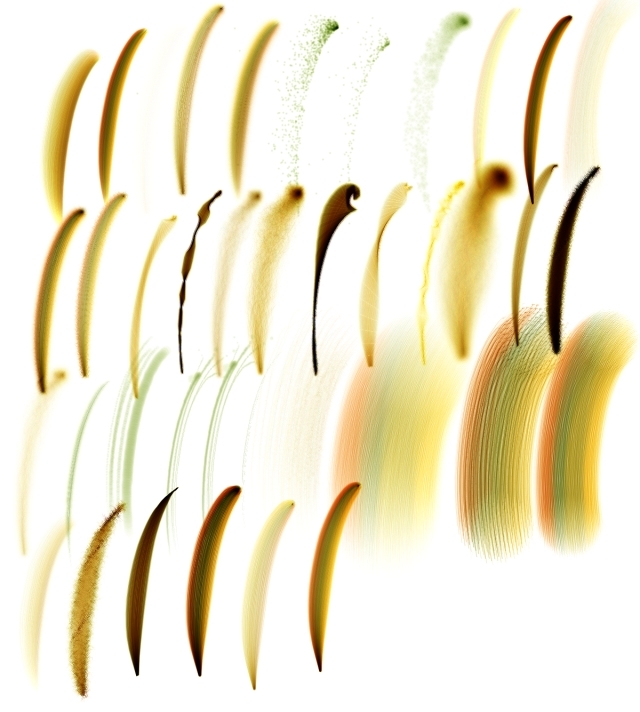 I really enjoyed reading about the process of brush creation. I have never tried before! Hey Bean…just wait. I really haven’t talked about creation, just naming and culling. I’ll get to actual creation later…wow, that sounds a bit over the top doesn’t it? It doesn’t happen in seven days, that’s for sure.